SMS sister company Cruise and Passengers Services (CPS), which provides services to Portsmouth International Port (PIP), has been named as a finalist in the prestigious annual Seatrade Cruise Awards announced at the Seatrade Europe Cruise and River Cruise Convention in Hamburg. 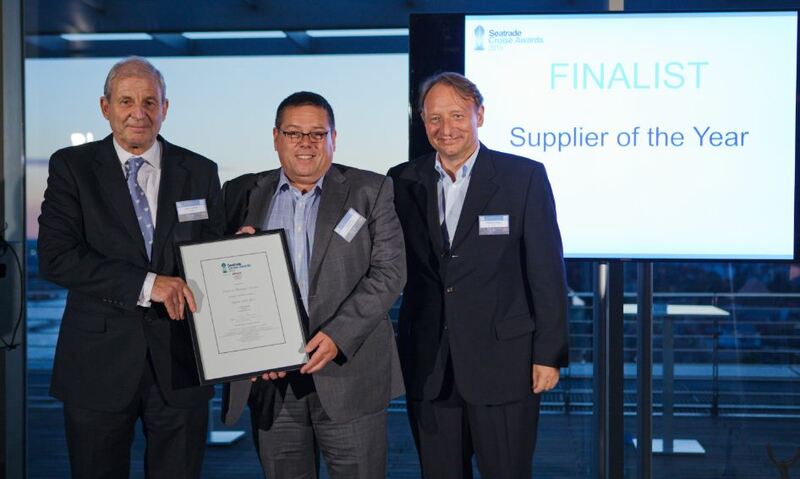 CPS was judged to be one of the top three companies in the supplier of the year to the global cruise industry category. CPS is the UK’s leading valet parking company for serving cruise ship passengers and has further improved its services by upgrading bespoke hardware and software systems used by operatives at each of its ports. CPS has operations at Portsmouth, Southampton, Liverpool and Oban in Scotland, ensuring the safe keeping of some 75,000 cars while passengers are away. Judged by an independent panel of experienced cruise industry specialists, the Seatrade Cruise Awards are one of the highest accolades in the cruise industry. The Seatrade Cruise Awards form part of the series of global Seatrade events, websites and publications that covers every aspect of the cruise and maritime industries, bringing together key people to encourage innovation and to produce powerful learning, networking and promotional platforms. When you’re transporting the tallest sailing masts in the world you need to be sure they are securely fastened to the barge carrying them and that was the challenge set for Southern Maritime Services in a weekend operation at the Portchester location of Magma Structures. 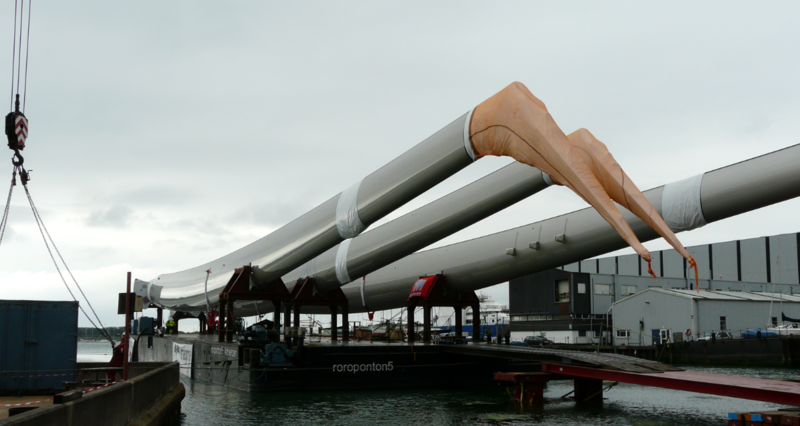 The three composite structures, measuring around 100 metres, were loaded on the barge for the voyage to Germany where they will be fitted on the world’s biggest sailing yacht, currently in build at the Nobiskrug yard on the Eider River in Rendsburg. 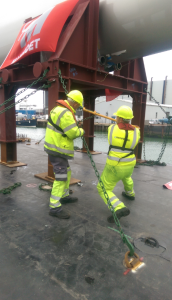 A special barge was brought into Portsmouth International Port to ship the masts but a key requirement was the ability to lash the masts securely for the voyage across the North Sea. SMS was called upon to provide both expert labour and additional ten-tonne lashings to carry out the task as the masts were carefully moved out of the Magma Structures workshops and placed on the barge ready for towing to Germany where they will be fitted on to the 170m. yacht, which is due for delivery next year. 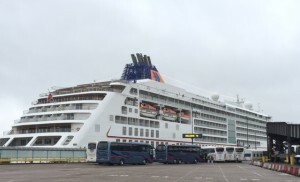 Cruise ship handling experts Southern Maritime Services (SMS) ensured that 450 German passengers were treated to the attractions of South of England when the cruise vessel Europa 2 became the latest new ship to visit Portsmouth International Port (PIP). Hapag Lloyd’s Europa 2 called in the port as part of a North European itinerary, arriving from Honfleur in Northern France and sailing for St.Peter Port in Guernsey after a day stop in Portsmouth that saw them enjoy coach tours to a wide range of tourist attractions. 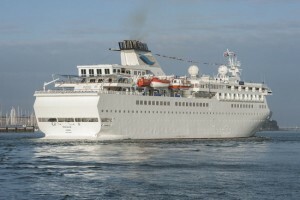 The luxury cruise ship is the latest in a series of new callers visiting PIP this season. Overall, SMS will handle nearly 40 cruise ships calling in Portsmouth this year. “Portsmouth is an ideal destination for cruise ship passengers wanting to visit the South of England’s major tourist locations and we were able to work closely with our suppliers to ensure that the passengers made the most of their one-day stop in the port,” explained SMS General Manager Alex Fernandez. Cruise specialists Southern Maritime Services (SMS) have notched another first in ships handled with the maiden visits to Portsmouth International Port (PIP) by the exclusive Noble Caledonia vessel Ocean Nova. 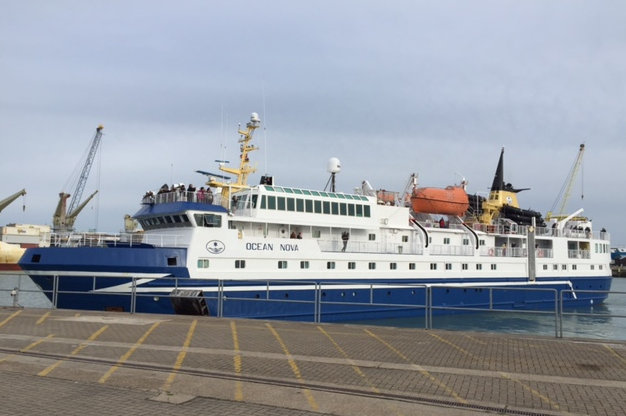 The specialist expedition ship, with capacity for only 84 passengers, has made two calls at PIP as part of her itinerary of round Britain cruises. 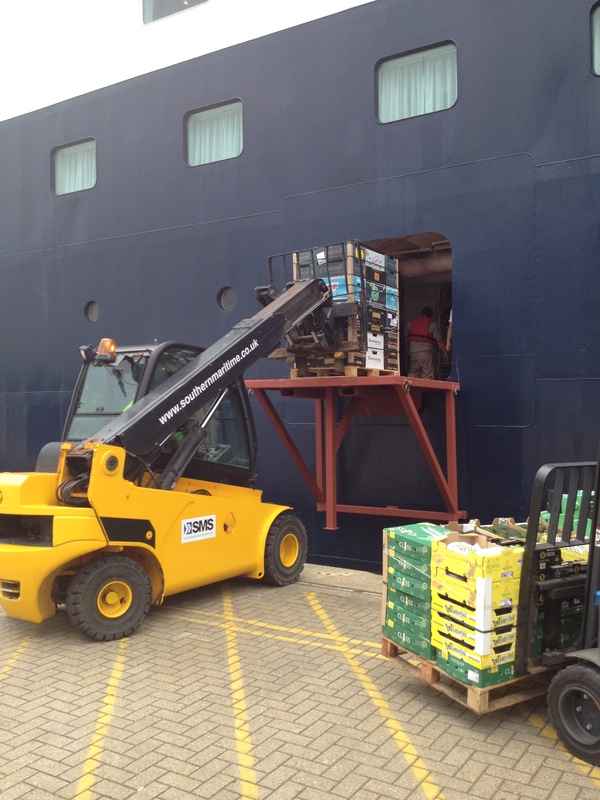 SMS, the exclusive cruise handler at PIP, handled passenger baggage and loaded stores such as fresh produce during the Ocean Nova’s turnarounds, completing her second call before sailing on a ten-day cruise to various bird islands around the UK West Coast, including the Isles of Scilly, Lundy, Portrush and St.Kilda before completing the voyage in Oban. 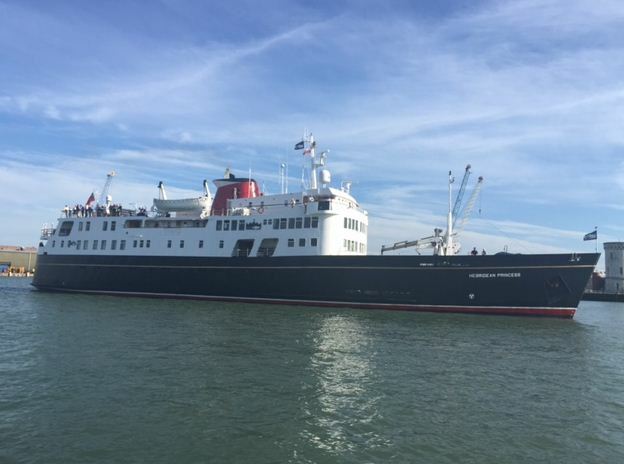 Cruise ship specialists Southern Maritime Services (SMS) have handled the Noble Caledonia vessel Sea Explorer for the first time at Portsmouth International Port (PIP). The luxury cruise ship, with capacity for just 114 passengers, made her maiden call at PIP when she started a UK and Ireland cruise. It was the first of two calls she is due to make this season with both being supported by SMS as PIP’s exclusive cruise ship handling company. SMS provided ship’s agency, stevedoring and baggage handling services to Sea Explorer, including loading stores for the six-day voyage. 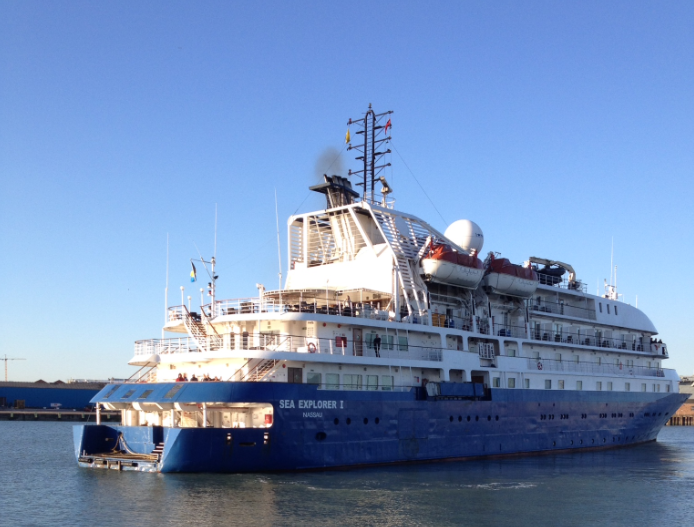 Sea Explorer’s two calls are among nearly 40 cruise ships that SMS will handle in PIP this year. “Sea Explorer is a small and exclusive ship whose passengers expect premium service and a smooth turnaround operation is essential to maintain the standards that the ship sets,” explained SMS Director Paul Kempton. Stevedoring and ancillary services company Southern Maritime Services (SMS) has signed a three-year contract with Portsmouth International Port (PIP) to provide support services for all cruise ships calling in the port. The agreement will sustain up to 40 jobs each time a cruise ship calls in the port, which is set to handle a growing number of callers this year. 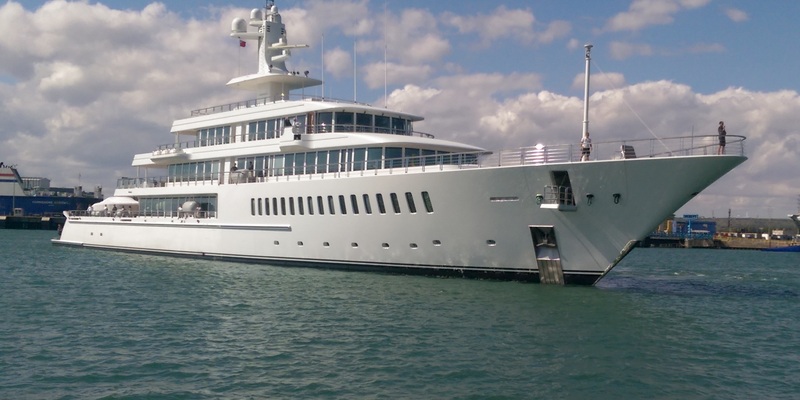 PIP, owned by Portsmouth City Council, continues to expand its cruise business with a total of 41 calls booked for 2015. More than half the calls will be turnaround operations with ships disembarking and embarking hundreds of passengers each time. The first cruise ship call by the vessel Voyager, operated by Voyages of Discovery, arrived this month (March) and calls will continue until November. New callers at the port this year include Hapag Lloyd’s Europa 2, the Portuguese ship Funchal and Noble Caledonia’s Sea Explorer. Utilising dedicated passenger check-in facilities in the main terminal, SMS offers a turn-key service for cruise ship clients, taking care of passengers, their vehicles and their baggage from the moment they arrive at the port. Services include meet and greet; baggage handling; passenger check-in; passenger registration; porterage; stores and baggage loading, and valet car parking. In addition, the company has its own fleet of fork lifts, telehandlers, platforms, cages and conveyors to receive and load cruise inventory, hotel, food and beverage stores onto ships, along with loading and unloading passenger baggage. SMS is part of the Independent Port Handling group of companies, which also provides support services for cruise ships in Southampton, Liverpool and Leith in Scotland. Stevedoring and ancillary services company Southern Maritime Services (SMS) has handled the unloading of a newly-built Gosport ferry at Portsmouth International Port (PIP). The 250 tonnes vessel, named Harbour Spirit, was discharged after arriving on board the cargo ship Amoenitas from Croatia and was unloaded into the water before making the short crossing to her new home in Gosport. She is similar in size and layout to the existing ferry fleet and will replace the 1966-built pair, MV Gosport Queen and MV Portsmouth Queen, on the route between Gosport and Portsmouth. 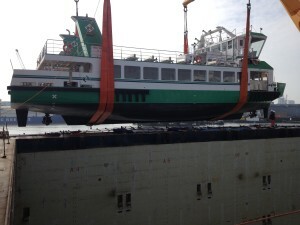 Harbour Spirit will carry up to 300 passengers and will include more modern facilities and better cycle storage. SMS is one of the leading stevedoring companies at PIP, including handling all the port’s cruise ship callers. Stevedoring and ancillary services company Southern Maritime Services (SMS) has kicked off a busy 2015 cruise season at Portsmouth International Port (PIP) by handling the Voyages of Discovery ship Voyager. The 15,270 tonnes Voyager arrived from Spain and set sail on a 16-day cruise to the Norwegian fjords and into the Arctic Circle with nearly 440 passengers. SMS, which handles all cruise ship callers at PIP, also disembarked some 450 passengers and placed on board a full load of food, provisions, beverages and technical stores, including supplies sourced locally. The call was the first of 37 cruise ship visits being made to PIP this year, with the Voyager scheduled to make six calls between now and the middle of May. SMS also carried out passenger check-in and embarkation, valet car parking and ship’s agency as part of its programme for the Voyager’s maiden seasonal call.